Neil Braidwood pulls on his wetsuit and takes the plunge. Coasteering is the act of working your way around a rocky coastline, combining climbing, scrambling, swimming and jumping. 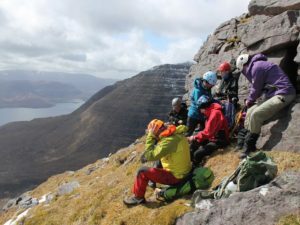 You will get wet, so wetsuits, buoyancy aids and helmets are compulsory. Trainers with a good grip or ‘wet’ shoes are essential too. 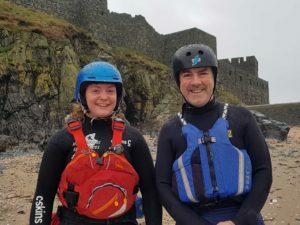 I was on a visit to the Isle of Man, where I was to meet my guide Keirron Tastagh and his daughter Alice from Adventurous Experiences to get kitted out. I had brought old shorts to wear over the wetsuit – these help to protect the suit if you are sitting on, or sliding down rocks. 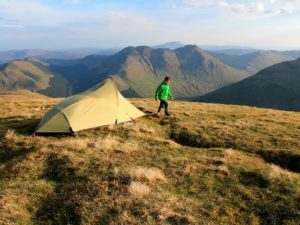 Keirron was born on the Isle of Man, and started the business in 2004, working particularly in watersports such as kayaking and coasteering. On the way to Fenella Bay, at Peel on the west of the island, Keirron explained he was very familiar with this part of the coastline, leading hundreds of experiences along it every year. 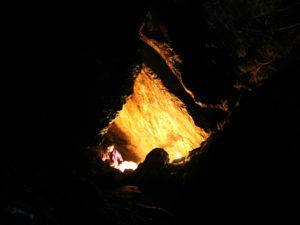 Still excited by creating new adaptions and developments to the activities and locations. Today, the sea looks quite choppy – the remnants of Storm Callum a few days before – and we stand on the beach while Keirron explains what we are going to do during the thorough safety briefing. Shoes must be on tightly with laces tucked away and helmets and buoyancy aids secured. Tracing a line with his outstretched finger around the islet, Keirron explains that we will climb along the rocks at sea level, and when we can’t 'traverse' any more, jump/step into the sea and swim to the next outcrop while we work our way around. He expects it to take a couple of hours in total, from meeting to finish and I am feeling nervous but excited. We start simply, with Keirron in the lead and Alice behind me, clambering on the rocks to get a feel for them. They are much slippier than I had expected, but the rock formations occasionally has grooves which I am able to jam my feet into to get a better grip. The rocks are encrusted with sharp barnacles, and I am told to be careful. As we work our way further into the sea, waves crash against our legs and I learn to pre-empt these as I don’t want to lose grip. Keirron is scrambling ahead of me, and I try to concentrate on where he is putting his hands and feet, but it is tricky as I am also figuring out where to put mine. He explains that this same coastline is entirely different when the tide is high (it is low tide at the moment). We take a short breather in a cave and examine the sedimentary rocks which seem to have been pushed up from the sea forming blocky, geometric shapes. We pause at a nearby rockpool to look at Beadlet Anenomes. Blood red, with tentacles that sway in the tide, these will sting and catch passing prey. We press on, and eventually come to a spot where we can climb no more, so are forced to jump in and swim to the next outcrop. It’s not a jump, more of a step into the sea, but I must do it as the waves are receding, so that I am pulled clear of the sharp rocks. Keirron steps in first and bobs below me waiting to give the signal for me to jump. When I do the sea pulls me back and I too bob about while we wait for Alice. I feel pretty buoyant, thanks to the buoyancy aid, and Keirron advises that if I become tired swimming, I should just flip on my back and relax. We have to do that a fair bit while waiting for the waves to subside, for a gap in the swell. 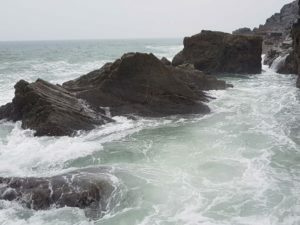 The next rock seems high and I wonder how we are ever going to scale it, but the waves rise and fall, and allow us to see and find footholds ahead of us. Keirron gets up first and indicates where I should be grabbing for. My fingers are weak in the handhold, and it is difficult for me to haul myself up against the vertical rock face. Keirron is there though, reaching out for my other hand and plucks me out of the water with one movement. We’re on the move again, scrambling over and down rocks, and jumping and sliding in and out of the swelling sea. I feel totally safe with Kierron and Alice, but without their skills to guide me I would be pretty terrified. 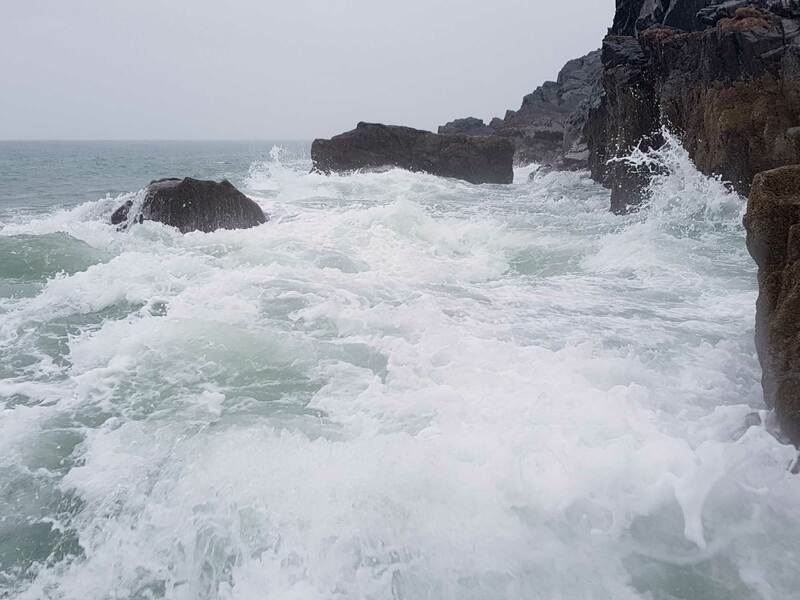 The sea is getting stronger and as we perch on a rock waiting to jump in to swim to the next promontory, I can see Keirron watching the waves carefully and shaking his head. We wait, and watch in dismay as the waves crash in and almost submerge the promontory we were heading for (see photographs below). 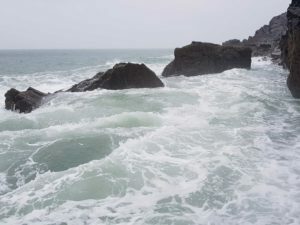 We are further round the islet and this part is much more exposed and the waves just won’t let up. Keirron decides we must turn back. It is too dangerous. 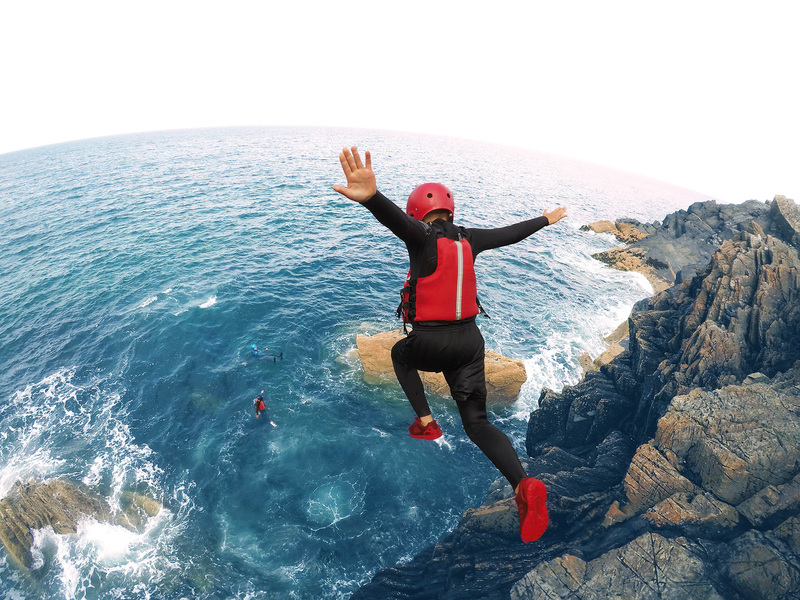 Coasteering as a leisure activity, is relatively new, beginning in the early 1990s, and forming an officially recognised body – The National Coasteering Charter in 2010, which is recognised by the Adventure Activities Licensing Authority, Marine Coastguard Agency, RNLI, RoSPA. It’s something that should be undertaken with the help of a recognised guide, as I discovered today. We decide to drop back in to the sea where we are and swim across the bay to the other side, where it looks less choppy. It’s quite a distance, but Keirron advises me to “just doggy-paddle. You don’t want to tire yourself out by doing the crawl.” As we get close to the opposite rocks though, the waves pick up again, and Keirron calls it all off. We’ve been out for a couple of hours at least, and it has just flown by. Suddenly I feel quite tired as we paddle to the shore – but elated too. 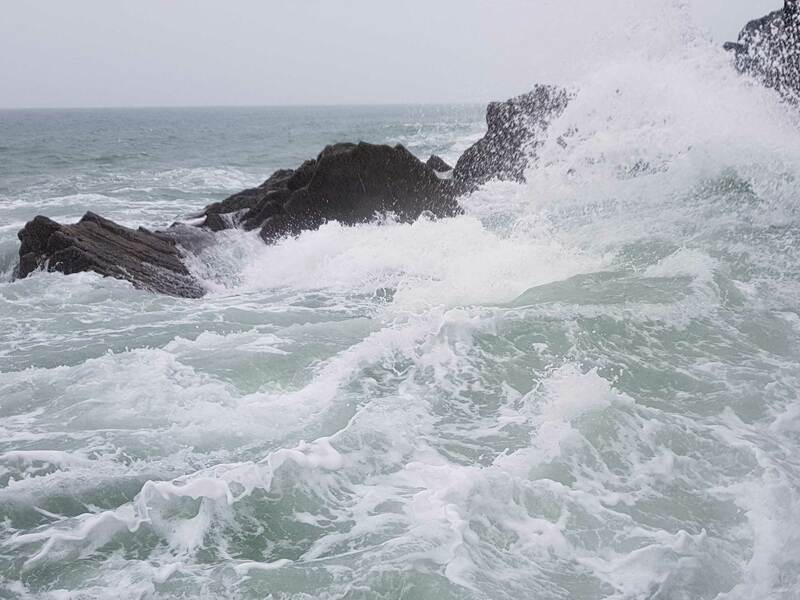 The sea was more than challenging today, but I felt safe with Keirron and Alice watching out for me. It’s always difficult to call something off, but when you are faced with dangerous waters like we witnessed, it is a sensible move. 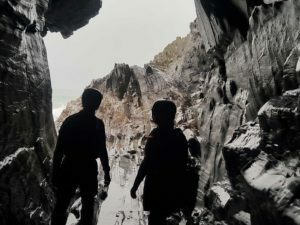 Adventurous Experiences offer coasteering, sea kayaking and gorge scrambling trips by appointment.